Rich, often moist (even swampy) deciduous forests; persistent after clearing and hence sometimes in fine stands along forest roads. Frequently growing with O. claytonii, but usually restricted to rich moist sites. Ordinarily one can readily distinguish this species in the field from O. claytonii by its taller, stiffer habit with redder, more glabrous stems; the flowers tend to be larger (petals often ca. 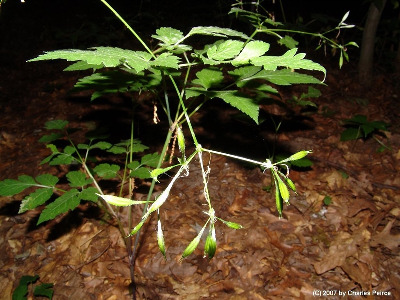 1.5–2.2 mm long, at least on bisexual flowers) and, as they are more numerous in the umbellets (due mostly to a larger number of staminate ones), the plant is more showy. Bracts of the involucel tend to be broader than in O. claytonii (often over 1 mm). Rarely the stem is densely villous (var. villicaulis Fernald). Bruised foliage of O. longistylis has a licorice odor, while that of O. claytonii has a carrot-like odor. MICHIGAN FLORA ONLINE. A. A. Reznicek, E. G. Voss, & B. S. Walters. February 2011. University of Michigan. Web. 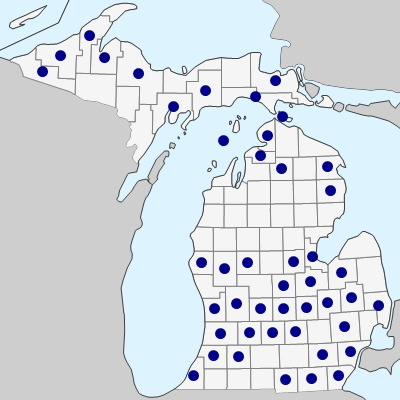 April 26, 2019. https://michiganflora.net/species.aspx?id=132.